The Spier Wine Farm dates back to 1692 and is located on the banks of the Eerste River, close to the historic town of Stellenbosch and just 50 km from Cape Town. 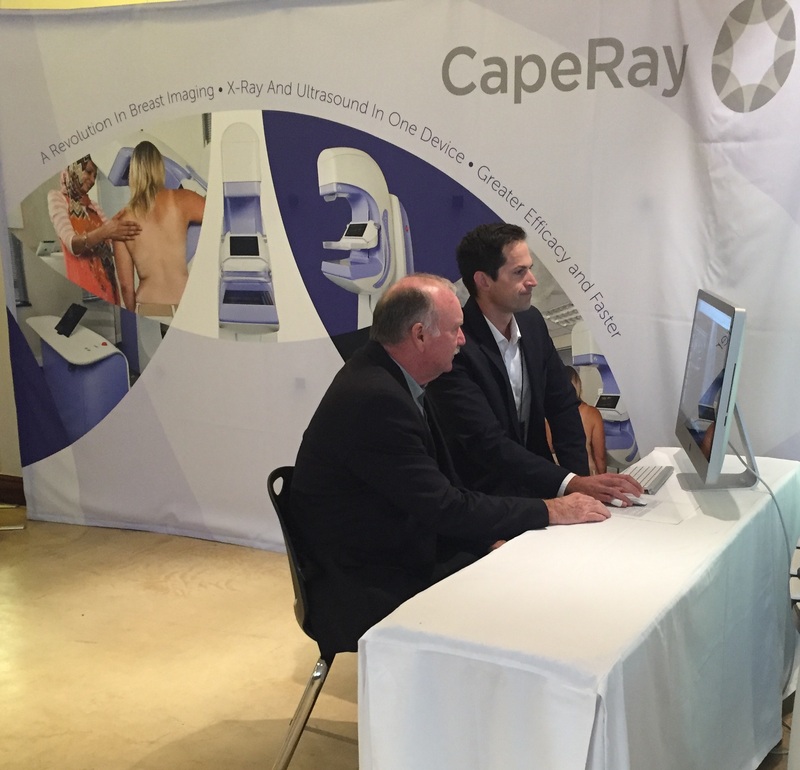 Set among oak trees and iconic Cape Dutch gables, the Spier conference venue is the site for the second annual congress of the Breast Imaging Society of Southern Africa. The pre-conference workshops – covering tomosynthesis, contrast-enhanced mammography and 3D biopsy – were held yesterday, while the official opening of the three-day congress took place earlier today. While CapeRay has previously exhibited in Vienna, Düsseldorf and Barcelona, this was our first local congress. Almost 300 delegates attended the opening session that featured three presentations by Jessica Leung, professor of diagnostic radiology at the MD Anderson Cancer Center in Houston, Texas. She spoke about the facts and controversies surrounding breast cancer screening, introduced a risk-based approach and concluded with a discussion of breast density and supplemental screening. Next up was Michael Linver of Albuquerque, New Mexico, who gave an overview on the use of mammography in benign and malignant pathology, while Maxine Jochelson of New York spoke about the management of BI-RADS 3 lesions. A key supporter was the Society of Breast Imaging (SBI), based in Virginia, USA, that sponsored five of their members – including Leung, Linver, Jochelson, Reni Butler, and Wendy DeMartini who serves as the vice president of SBI – to attend and present at the meeting. There were 12 vendors supporting the congress, each with exhibition stands measuring 3m x 2m. The one exception with a 6-metre long stand was Siemens Healthcare that has just rebranded itself as Siemens Healthineers. The other multinational companies included GE, Philips and Bard, while there were seven local companies that distribute imported products: Lomaen Medical (FujiFilm and Esaote); SSEM Mthembu Medical (Faxitron, ViVix, Samsung); Axim (Giotto and Hitachi); Marcus (Cook Medical); TecMed Africa (Toshiba and Metaltronica); Adcock Ingram (Becton Dickinson); and Vertec (Hologic). CapeRay (seen above) was the only local manufacturer in attendance. The opening day concluded with a cocktail function followed by a presentation entitled “Almost human – Homo naledi and the origins of humankind.” The speaker was Lee Berger, professor of evolution at Wits University in Johannesburg, who was recently named by Time magazine as one of the world’s 100 most influential people. He gave a fascinating account of the discovery of pre-humans who lived 2.5 million years ago, speculating that the 15 individuals were found in a prehistoric burial chamber. Now that was quite an exhibit! From UCT (outside now) recognition, to Naledi Pandor, to international conference participation, to parliament (without being thrown out), to rubbing shoulders with Lee Berger and Homo Naledi (undated as yet! ), Cape Ray is ready to fly as an established, industrially backed business. I suggest renaming it Cape Hooray. THE D 2 MAMMOGRAPHY MACHINE. COMBINE D 3 WITH D 3 ULTRASOUND ,AND BOB IS YOU WINNING UNCLE! 2. To build a beautiful clinic-ready system that we could ship to Massachusetts General Hospital in Boston for Dan Kopans to evaluate, would require $250,000. This is certainly not an inordinate amount of money. THIS IS THE FUTURE OF CUTTING EDGE MAMMOGRAPHY!